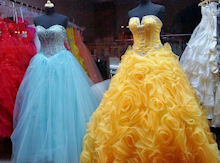 Clearly, prom is a big event in a girl’s life and one that produces visions of glamour and fun. It’s also big business for hair salons, dress shops, and florists. Getting ready for prom night requires decisions and more decisions. So, what's a girl to do and where should she start? Besides planning your evening, you will want to choose a unique dress, shoes, and handbag. Not only that, there's makeup, hair, and nails to do. Our prom guide will give you lots of ideas and inspiration for beauty, hairstyles, and gowns so that you're prepared for a memorable evening at the dinner and dance. Create a look you've always dreamed of. You'll look beautiful for a special evening with these tips for makeup, dress, and accessories. Wait! You're not done. Here's how to take care of your lovely, formal dress before and after the prom. Not sure how to wear your hair? 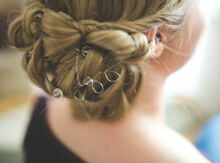 Long or short, we've got ideas and styling tips for the perfect hairdo to compliment you dress. Want to find the perfect dress for prom? Learn what flattering new styles and colors are trending now for the new spring season.